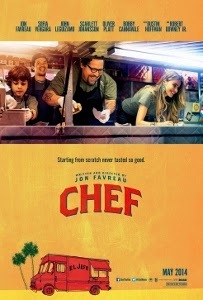 If you’re interested in Chef, the new film from writer-director-producer-star Jon Favreau, wait for it to hit home video and turn it off after Chef Carl Casper (Favreau) acquires a beat-up old taco truck. Enjoy the first half, which is compelling and uncomfortably funny, because there’s nothing but self-indulgence and outright fantasy in the second half. Chef is one of the most tonally inconsistent and infuriatingly muddled movies I’ve seen in recent years. It gets off to a great start. Carl is a talented but frustrated chef who works at a chic L.A. restaurant owned by Riva (Dustin Hoffman). Aware that noted food critic Ramsey Michel (Oliver Platt) will be paying a visit, Carl crafts an all-new menu and hypes up his kitchen staff, including sous chef Tony (Bobby Cannavale) and line cook Martin (John Leguizamo), to do their best. The only problem? Riva insists Carl stick with the established menu. “How would you feel if you went to see The Rolling Stones,” Riva asks, “And Jagger didn’t sing ‘Satisfaction?’” Ramsey, it turns out, isn’t impressed with the offering. He not only criticizes the food, but throws in personal cheap shots at Carl to boot. In the background, as Ramsey’s two-star review improbably becomes a viral sensation (it really wasn’t that bad), is Carl’s ten-year-old son Percy (Emjay Anthony, delivering a perfectly unaffected performance) and his ex-wife Inez (Sofia Vergara). Percy feels neglected by his always-working dad, while Inez… Well, we never learn anything about her except that she was married to a rich businessman (Robert Downey, Jr., in a fun cameo) before Carl. She and Carl seem to still love and respect each other, making it as hard for us to understand why they’re divorced as it is for young Percy. Carl’s persisting feelings for Inez don’t stop him from carrying on with hostess Molly (Scarlett Johansson), but honestly it seems he prefers his food to either of these beautiful women. Up to this point, Chef exhibits a sure sense of storytelling. But shortly after Carl’s public feud with Ramsey threatens to ruin his career, the film devolves into a tedious travelogue loaded with forced, feel-good clichés and unconvincing father-son bonding. 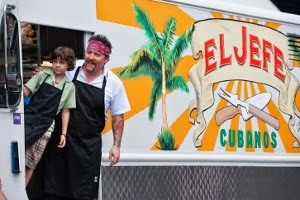 Carl and Percy, assisted by loyal cook Martin, hit the road selling Cubano sandwiches from a food truck. There’s lots of sumptuous-looking food (provided you’re not a vegetarian) and cutesy male-bonding moments (including Carl teaching his son how to coat his scrotum in corn starch), but all semblance of narrative drive simply dries up. There are endless reminders of Carl’s great parenting skills and, once in a while, Inez checks to say how much she misses Percy. Much has already been made about how all this is a metaphor for Favreau’s return to the small-scale filmmaking (Swingers, Made) that marked his early career, before he began cranking out big-budget product (some excellent: Iron Man, some underrated: Cowboys & Aliens). Carl lashes out at the food critic, crying about being forced to compromise his artistry by churning out inferior, creativity-stifling product. He lashes out at his boss for treating the restaurant and its food like a business. Hey Carl, your boss is right. Give the people what they want – they’re paying good money for it, after all. The critic you’re so desperate to please may or may not have appreciated your more adventurous menu items, meanwhile there’s a restaurant of hungry people waiting for what appears to be high-end comfort food. In other words, restaurants are a business and so are movies. That doesn’t mean there’s no place for creativity, but ultimately these two industries are driven by commerce rather than art. Besides, Carl’s answer to his crisis of conscious is to shill what is essentially fast food (the Cubanos) for a mass audience (the hoards of people, attracted by Percy’s ace social networking skills, queuing up at the El Jefe food truck). When I plunk down good money, whether its five bucks at McD’s or $200 at a sit-down place, I don’t care about the personal problems of the restaurant staff. Similarly, when I shell out 12 bucks for a movie ticket, instead of thinking about all the blood, sweat, and tears the filmmakers invested, the bottom line is I want to be entertained for the price I paid. Chef did that for 45 minutes or so, but after that it felt like a slap in the face. A willfully lazy piece of meandering fluff from a filmmaker I know is capable of so much more.